Things were looking positive for the Gators at halftime with a 4-point lead but after getting thoroughly out-executed in the second frame they ultimately fell to the rival Kentucky Wildcats by a score of 65-54. Not only did Florida have a 4-point cushion at the half but a run marked by solid offensive execution ballooned that lead up to 11. Considering the fact they ended up losing by 11, you can see how the wheels really fell off. Closing the game on a 34-12 run Kentucky never allowed the Gators to get comfortable with the lead and was the team that played with a lot more confidence than the Florida roster who has let multiple double digit leads slip this season. Florida was willing and able to deliver the first punch of the second half but when Kentucky struck back it was clear the Gators weren’t fully equipped to trade blows. It was looking for much of the evening that this was going to be a statement win for the Gators but unfortunately it’s just back to the drawing board for them. When a close game comes down to the wire usually the team with better shot creation is going to come out victorious and that played itself out today. KeVaughn Allen, Jalen Hudson, Noah Locke, Andrew Nembhard, and Jalen Hudson were all unable to generate good looks in the final stretch of basketball while Tyler Herro, PJ Washington, and Reid Travis were all getting to their spots on the floor and making the Gators’ defense crumble. Herro was particularly effective with 17 points, many of them coming in the important stretch of the second half with his ability to get to the hoop or get his jump shot off against any defender. Florida’s leading scorers on the season Allen (3-12) and Locke (2-11) were particularly bottled up and after a 10 point first half Andrew Nembhard got suffocated in the second by Ashton Hagans, one of the best defenders in the country. 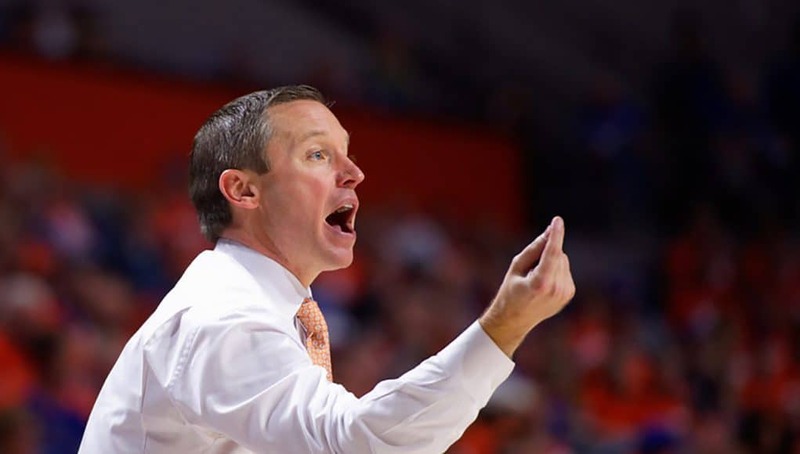 30 minutes of good basketball isn’t enough against great competition and 10 minutes of poor play was what took this from an 11-point win to an 11-point defeat for the Gators. Giving up a ton of size in the paint the Gators actually did quite well at competing on the block and they didn’t allow Kentucky to bully them down low. Limiting Reid Travis to only 6 points was a particularly impressive feat, though they often did it by gambling with some double teams that left shooters wide open. Luckily for the Gators shots weren’t falling for Kentucky so ultimately it looked like a pretty good strategy. Andrew Nembhard, Michael Okauru, and Deaundrae Ballard had some pretty good stretches of battling bigs down low on switches and they should be commended for their effort. Kentucky was +10 on the glass but given how good they normally are at rebounding I’ll say that was a relatively manageable number for the Gators and it definitely wasn’t the reason they lost this game. This game saw a reunion of Oak Hill Academy teammates in Florida’s Keyontae Johnson and Kentucky’s Keldon Johnson and though he had some big shots I’m going to give the nod (call me a homer) to Keyontae with 8 points (3-7 shooting), 10 rebounds, 1 assist, 1 block, and 1 steal over Keldon who had 10 points (4-12 shooting), 7 rebounds, and 1 assist. Keyontae very well could be the player of the game for the Gators and it was him going to the bench in the second half with his third foul that started a comeback for Kentucky. With two blocks today Kevarrius Hayes overtook Al Horford for second in all-time blocks by a Gator. Both were tremendous swats early in the game and I think it was a fitting way to slide into second place in the record books. He fumbled a few balls today but fought hard and anchored the Gators’ defense, as always. This was yet another game where it was made apparent that the Gators don’t have many great closers. KeVaughn Allen has hit some big shots in his career but hasn’t been a consistent player at getting his own shot against set defenses and his friends in the backcourt Andrew Nembhard and Noah Locke don’t have that skillset either. Jalen Hudson was supposed to be that guy, and we obviously have seen what has happened to him this year, so this team is just left in a panic mode in these close games. For the first 30 minutes of the game Florida was playing some of it’s best basketball of the season and unfortunately that won’t be remembered as poor execution down the stretch cost them the game in a way that didn’t even make the contest look close.